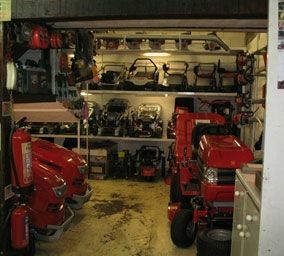 In our organised and fully comprehensive workshops, we have the facilities and abilities to service and repair all major brands and types of garden machinery. We can deal with a wide range of machinery including domestic petrol garden tractors, lawn mowers, chainsaws, strimmers and leaf blowers. 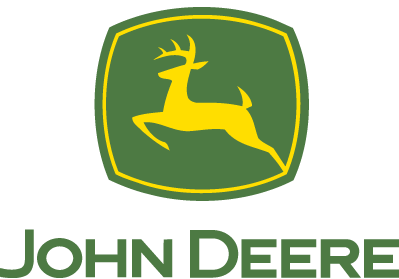 We also deal with commercial petrol and diesel professional turf management machinery. In this age of throw away and replace with new, we are proud to be able to offer a light fabrication repair service and are able to weld mild steel, stainless steel and aluminium. 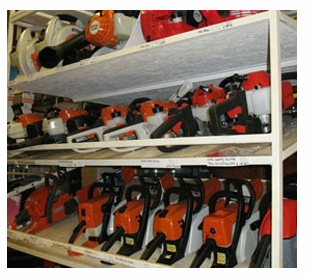 For customer convenience, we also offer a garden shear, loppers and edgers sharpening service. Our quick turnaround chainsaw sharpening service is legendary within tree surgeon circles and if we cannot sharpen it, we can replace it. If you prefer to sharpen your own, please check out our chain sharpening kits, which are for sale in our consumable section. When your machine comes in for service, it will first be jet washed and then a thorough look over will follow, to check operation. Any remedial work required will firstly be cleared with you, the customer, prior to servicing/final check over and returning to you. Aspen 2-stroke Full Range Technology and Aspen 4-stroke alkylate petrol are the cleanest forms of petrol that is available on the market today. Why not try some when you collect you machine? For your convenience, we offer a collection and delivery service if required. Please contact us today for further information on any of the services we can offer you. We look forward to hearing from you. You can contact us on 01420 511133, where one of our friendly members of staff will be able to assist you or get connected for free using Click to Call.